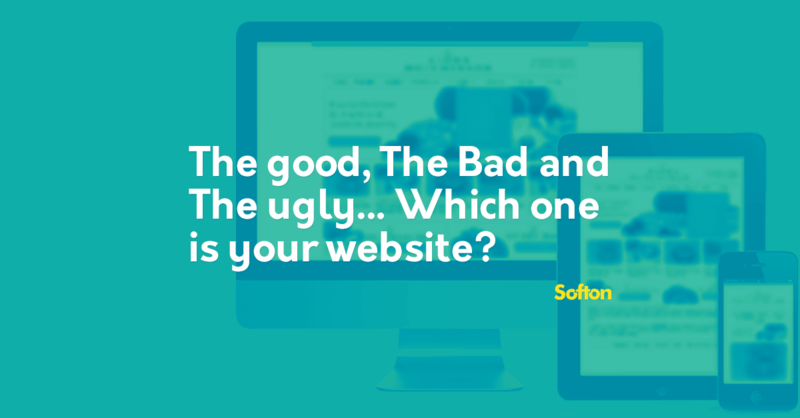 The good, The Bad and The ugly… Which one is your website? People interact with businesses very different nowadays than they did just a few years ago, these days the most common form of engagement between businesses and their clients or potential clients is through sophisticated, modern, web interfaces. An outdated website says more about your business and its future than you might think, but, looks is not all that is important when it comes to an online presence. Functionality, speed, and, intuitiveness, and security are a lot more important than pretty graphics. “The goal of our web development services is to propel our customer’s businesses, taking them to the next level and ensuring their ongoing success in this ever-changing technological environment” commented Marco Tonti CEO of Softon ITG. There is no set rule as to when it’s time to revamp your business site, in general terms though, it is advisable to update sites every 18 months or 2 years the most. While your front end may change more frequently as you change graphics and add content, the backend of your site becomes obsolete when technologies evolve leaving it vulnerable to security threats and putting your business in a competitive disadvantage. Technology and trends are in constant flux; therefore, it is easy for websites to fall out of sync with their target audiences despite the best efforts of content managers and graphic designers to keep the site current. A complete revamp of your business website will help modernize your brand and adjust it to the current needs of users. As an example, responsive websites help expand audiences, reduce bounce rates and increase the level of engagement of users. Studies confirm that 76% of users list ease of use as a websites number one appeal, while more than 40% have stated they would abandon a website if this took more than 3 seconds to load. These statistics confirm the damage outdated technology can make to a company’s online presence. Newer technologies are designed to simplify behind the scenes processes making the site more user-friendly and improving its response time. Outdated technologies make it increasingly difficult for internal teams to manage a site’s content and updating its pages. This is because the way we use content today is not the same as it was used just a few years ago. Search engines constantly adjust their algorithms to improve search results and offer its users a more targeted experience, this means online marketing teams need to adjust how they handle content and how it is presented on their sites just to keep up. As mentioned before, web development technology has evolved, it has become more intuitive and this helps internal teams improve their performance in a budget-friendly way. Cybersecurity has now become a widely used branch of technology, and with good reason, hackers have proliferated over the years and hijacking corporate data for ransom or outright stealing it has unfortunately become a blossoming industry. An outdated website will not have the latest security measures built into its backend, and for a lot of sites, a simple upgrade is not feasible due to the age of the technology used. Building a new site from the bottom up, with newer technology and increased security features will help protect a company’s valuable data. “We love helping businesses make that important leap in upgrading their online presence. Our web development solutions offer a comprehensive approach, based on each client’s online goals,” commented Marco Tonti. Improving your online presence should be your number one priority, an experienced web development service like the one offered by Softon ITG can make the process fast, simple, and cost-effective.